Protected Van Lines is one of the youngest moving companies that we’ve reviewed, having been founded in 2015. They are based in southern Florida, and are the only company that we’ve reviewed so far that has been up front about the fact that they are a moving brokerage company. This means that they act as coordinators, hiring movers to pack, store, and move your items. Their services include long distance moves, corporate relocation, military moves, and storage. Protected Van Lines attracts many customers recently because of two key features: they offer a 24/7 phone line that is manned by a small group of customer service agents, who are part of the family that owns the business; and they offer some of the lowest prices in the moving services industry. Their estimates can be low, because prices are based on total weight, rather than the number or type of items you need moved; however, even negative reviews reveal that at the highest, most unexpected prices, Protected Van Lines still comes in thousands of dollars less than their competitors. Many popular moving companies are in fact moving brokerages that rely on third-party movers to perform services. However, Protected Van Lines is the first we’ve seen that declares this fact outright on their website. Reviews vary for the services they hire; roughly half claim that their service was fantastic, while the other half experienced difficult situations with rude or unprofessional movers who damaged or lost their goods. In these instances, Protected Van Lines was unable to offer any help retrieving items or reimbursement. Customer service from the 24-hour phone line receives equally mixed reviews. Daytime calls, especially those from potential clients, are met with eagerness and patience; however, it is increasingly clear that after-hours calls and in-process clients receive less than enthusiastic customer service from Protect Van Lines. They do offer an email address and an online contact form, both of which are answered speedily during standard business hours. 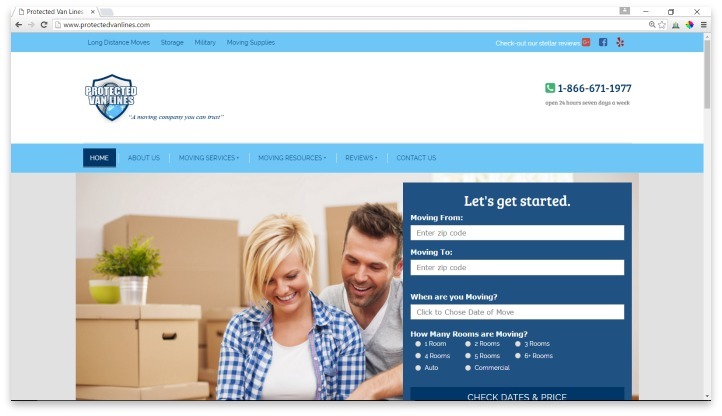 Their website includes information on your rights and responsibilities during a move, as well as a handy checklist for moving that you may find useful. Protected Van Lines offers low prices (prices are based on total weight, rather than the number or type of items you need moved) with great 24/7 customer service. At the end of the day, experiences with Protected Van Lines are highly dependent on the quality of the third-party mover that is hired. Because you can’t control who is chosen to pack and move your items, you do take the risk that you’ll end up with a service that isn’t as professional and helpful as others. You may also find that the service that packs up your household is not the same service that delivers your items at your new home. While you should expect the price to go up, possibly more than once throughout the entire experience, it’s probable that you’ll still end up paying far less than a competitor would have charged when working with Protected Van Lines. If you are on a budget, and want a frugal service that is still going to offer a service that is at the least, average, Protected Van Lines is a good choice. Their upfront honesty about their services, and their balance between frugal and full-service, makes Protected Van Lines a service to keep on your list of potential movers. Have you had an experience with this company? Please share your Protected Van Lines reviews below.